iSuppli posted updated OLED TV shipments forecast for 2013-2015, and they see a slightly lower shipment volume compared to their previous estimates in January 2012. Now the company estimates that in 2013 only 1,600 OLED TV sets will be sold. This will grow to 1.7 million TVs in 2015.
iSuppli assumes that the only OLED TV to ship in 2013 is LG's 55EM9700. They think that Samsung will not be able to start production of their F9500 OLED TV in 2013. This conflicts with reports from Korea claiming that Samsung will actually launch their OLED TV next week. Hopefully iSuppli are wrong on that one. iSuppli seems to be the most pessimistic market research company when it comes to OLED TVs. DisplaySearch says that the OLED TV market in 2014 will reach almost 2 million units, and in 2015 it will reach almost 5 million units. 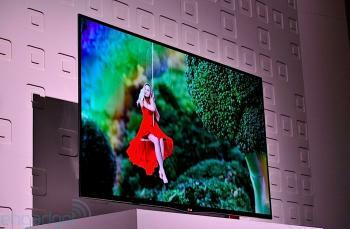 LG Display themselves sees a very small OLED TV market in 2013, and they expect it to grow to 600,000 - 700,000 units in 2014. In 2015 it will grow further to 3 million units (or about 1% of the total TV market). Taiwan's ITRI sees 50,000 OLED TVs sold in 2013 and 3.24 million in 2015.